Spending hours and hours on the Smartphone without an interesting application or game can be so boring. Talking Tom Cat (iPhone) is the ideal application to fill in fun times. It can respond to your touch and can repeat words you utter. 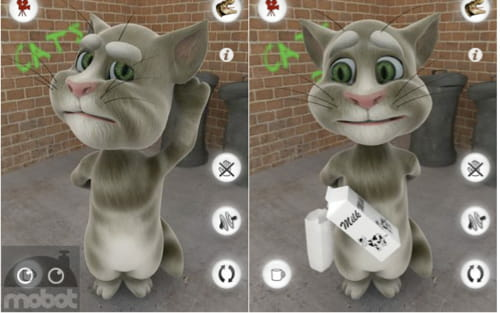 Controls: Talking Tom Cat (iPhone) can be the best solution for fun times. Once it is launched, just talk and Tom will repeat it. It is an application that will allow the whole family to have good times together. Interface: this application has an intuitive interface. Each feature is represented by an icon. By clicking on one of them, something happens right away. As an illustration, if you click on the icon of the dog, it will immediately appear to scare Tom. Fun: this is one of the funniest applications available on the Internet. Indeed, it is possible to hit Tom by slapping him via your iPhone. What is interesting is that when slapped Tom four or five times, the cat ends up falling down the ground. Latest update on November 22, 2013 at 09:11 AM.